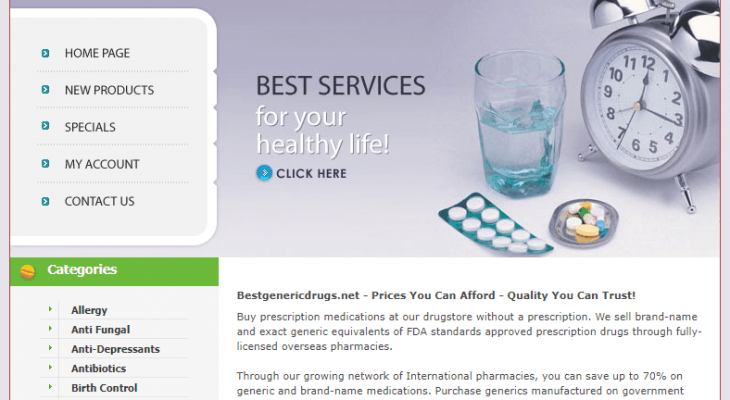 BestGenericDrugs.net sought to be a leading provider of affordable medication. Despite its name, the store used to stock both branded and generic medication as well as herbal meds and other supplements. The company can supply clients from all over the world without any hassle. Best Generic Drugs was offering fully licensed drugs at the lowest price, claiming to provide a discounted price up to 70% less than local pharmacies. The location of this pharmacy wasn’t displayed on the website. I ascertained that bestgenericdrugs.net had available medicines to treat a diversity of medical predispositions including obesity, hair loss, depression and sexual health. As for pricing, I must confess I’ve seen better. A box of 12 pills of brand-name erectile dysfunction meds was dispensed for $175 (Pfizer’s Viagra) or for $146 (Lilly’s Cialis). The payment options were rather limited as well. Bestgenericdrugs.net only allowed payment either with a credit card or international bank transfer (which is always subjected to an extra fee). Best Generic Drugs guaranteed a secure transaction thanks to its partnership with Ewinpay, an online safety transaction standard. As for shipping, I don’t know how much it cost or which method Best Generic Drugs used. Bestgenericdrugs.net was advertising a 10-return policy and a money-back guarantee in case of total dissatisfaction within 10 days after delivering the meds. BestGenericDrugs store could be contacted only through the contact form provided on the site. Nowadays, this store is no longer available as it closed for undisclosed reasons. It can be accessed via WayBack machine, although the remaining information is very limited. During this review, I learned that bestgenericdrugs.net had many issues with its deliveries and had a poor reputation among consumers, probably justifying Best Generic Drugs failure to thrive in the market. Bestgenericdrugs.net layout wasn’t anything fancy and, to be perfectly honest, I wasn’t even expecting to find reviews. However, a Google search showed me that Best Generic Drugs was quite a reputation among consumers. Unfortunately for the store, this reputation was not the best: Best Generic Drugs was known as a treacherous company, dominated by its clear delivery problems. Alimon shouts clearly that BestGenericDrugs.net is a “total scam” and no one should buy anything from the company. This client didn’t receive any confirmation e-mail 3 weeks after the payment. Moreover, the customer wrote Best Generic Drugs “4 times” and didn’t obtain any response. Jordi is not as angry as the previous client as he did receive his meds. However, he “paid extra” for fast shipping to no avail as he received the order within the time of regular deliveries. Mr. Green complains about having received only “one-third of order”. Besides having an incomplete order, the user is not sure if bestgenericdrugs.net sent the “real tablets” or not. I sense a high chance of being ripped off or receiving counterfeited products. I wouldn’t put my health in danger so I would never resort to BestGenericDrugs.net to get my meds. Despite being older, any consumer would step away from BestGenericDrugs.net after seeing such negative reviews. Due to Best Generic Drugs deficient management and insufficient credibility, it’s only natural that no one purchased something more recently. Therefore, there aren’t any more reviews evaluating this pharmacy. When I come across a lack of testimonials, I always use scam analyzers to concretely ascertain a store’s legitimacy. Once again and before going into details, I can say BestGenericDrugs.net was deeply not recommended due to trust issues. As anticipated, the pharmacy was described as illegal due to its no-prescription policy. Both Scamner and Scam Advisor conceded BestGenericDrugs.net a very low trust score: a flat 0%. Scamner showed me that Best Generic Drugs was rarely visited, which I find strangely reassuring. That way I know the store wasn’t deceiving many consumers. Scam Adviser strongly recommends staying away from this pharmacy. The store’s true location is being hidden, a common practice among those who have something to hide. Although not abundant, BestGenericDrugs.net did have a small discount for clients who returned to their shop. The store was prepared to offer a 5% discount on all reorders for every client who previously purchased from the store. I’d like to have seen something more, like freebies, but the reorder discount was the only one. Even without reading any reviews, I immediately had the feeling that BestGenericDrugs.net was a potentially dubious and dangerous website. After a much more careful analysis, I confirmed my thoughts and I strongly believe Best Generic Drugs was just another illegal online drugstore that was running a fraudulent business. Sadly, before closing, the pharmacy was able to trick some clients into buying from them. Needless to say, these clients didn’t have a pleasant shopping experience and exposed bestgenericdrugs.net as an online scam. Some never received their meds nor a proper response from Best Generic Drugs customer service team, while others complained about getting an incomplete or non-genuine set of medications. Selling uncontrolled and unlicensed meds is a very serious crime given the obvious implications such drugs may have on an individual’s health. Summing up all these negative reviews with the low trust scores provided by scam alert sites, I can’t recommend this pharmacy. Additionally, the drugstore was charging a superfluous amount of money for these meds; there are far better pharmacies with much lower rates than Best Generic Drugs. I am rating bestgenericdrugs.net with the lowest possible score: 1 out of 5 rating.